Planning for retirement requires a sensible look at your financial goals, and also your risks. Equitable Life operates as one of Canada’s largest mutual insurance societies, and offer plans that emphasize Equitable Life’s long-term planning and sustainability. Many Equitable Life insurance plan offer an easier way to build wealth towards retirement while securing your needs today. Equimax Estate Builder® Whole Life For Life, with a 20 year pay option Ages 0 to 80, or 85 with life pay Offers a higher long-term growth, making it ideal for covering the costs of inheritance and final expenses for your family. Equimax Wealth Accumulator® Whole Life For Life, with a 20 year pay option Ages 0 to 80, or 85 with life pay Offers higher growth in the first 20 years of the policy, making it an ideal plan for retirement planning. Universal Life For Life or to Age 85 Ages 0 to 80 Choice of Low Fee investment or Bonus funds option. Daily interest, Linked-index, and Guaranteed Deposit accounts to build steady wealth. Final Protection Life Insurance For Life Ages 40 to 80 No medical exam required. Cash value begins immediately on plan. You may stop payments at any time and keep a portion of coverage. EquiLiving Critical Illness 10 year term, to Age 75, or to Age 100 Ages 0 to 65 25 covered conditions and 5 juvenile conditions. Early detection benefit available. Living Protection Critical Illness 10 years or to Age 75 Ages 18 to 65 No medical exam required. Coverage of up to $50,000 available for 5 common critical conditions. 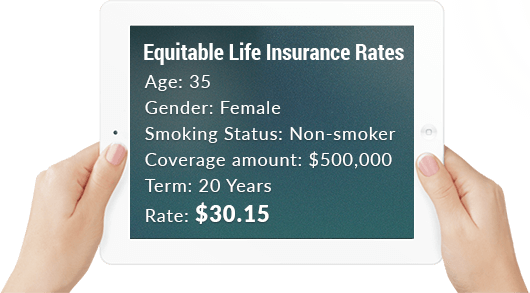 We are pleased to offer all life insurance products provided by Equitable Life. For a quote on all available life insurance plans, please use our no-obligation quote provided on the right to explore your options and find the right fit for your needs.